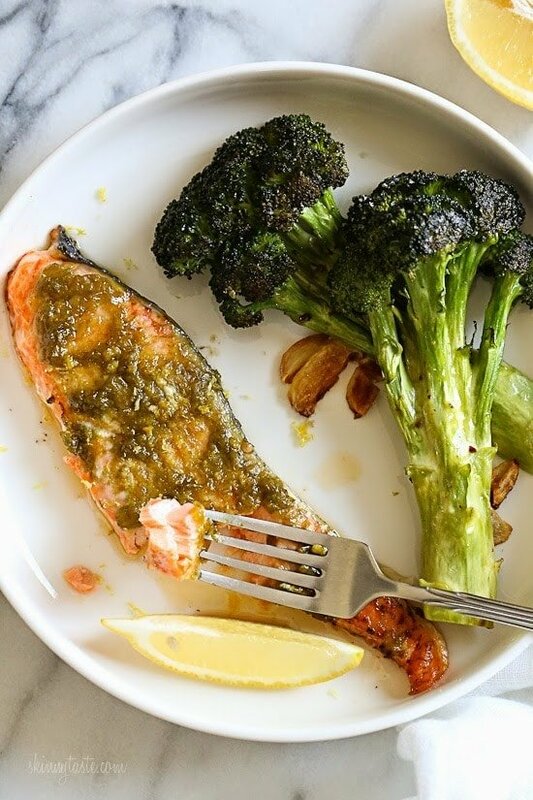 My 8 year old son absolutely loves this Asian-Marinated Salmon recipe so I make it almost every week. I like to encourage healthy eating habits and give the kids seafood as much as possible. However, while they don’t mind (and actually even prefer) repetition of meals, I like a little variety. 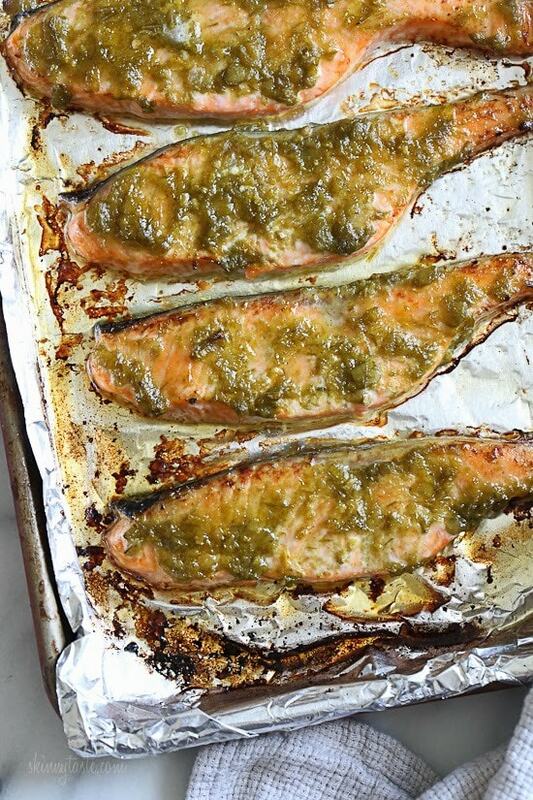 Today I made two versions; Asian-marinated for the kids and this spicy green harissa baked salmon for the adults. This dish is very easy to prepare. It didn’t feel like too much extra work. Also, my kids aren’t into foods with too much heat. If my husband and I are craving spicy food, sometimes two variations are a necessity. Harissa is one of my go-to sauces for adding a quick burst flavor to any ingredient. You can put it on veggies, meats, seafood, and eggs and even use it as a dipping sauce. For this recipe, I literally just smothered the harissa on top of the salmon with a little lemon zest and put it in the oven. A little sprinkle of sugar at the end helps it caramelize a bit and cuts into the acidity of the vinegar in the sauce. I used Mina brand green spicy harissa but you can use any kind you like or are able to find near you, including red spicy or mild. Harissa is one of my go-to sauces for adding a quick burst flavor to any ingredient. You can put it on veggies, meats, seafood, and eggs and even use it as a dipping sauce. For this recipe, I literally just smothered the harissa on top of the salmon with a little lemon zest and put it in the oven. Line a baking sheet with foil and heat oven to 400F. Cut salmon in 4 pieces and season with kosher salt. Spread harissa over the top of the filet and sprinkle with lemon zest. Bake for 10-12 minutes or until just opaque. 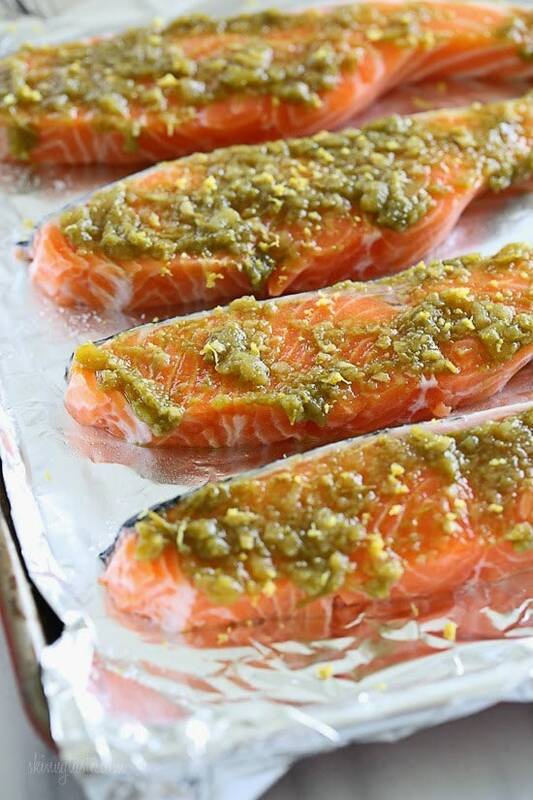 Remove salmon from oven and set to broil. Sprinkle sugar on top of fillet and return to oven for an additional 2 – 4 minutes until beginning to brown at edges and caramelize on top. 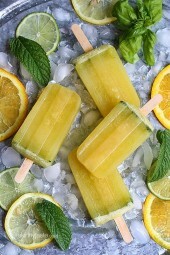 Sprinkle with additional zest, if desired, and serve with lemon wedges. It turned out surprising well! I paired it with corn, carrot spirals from Trader Joe’s and blanched kale. My child isn’t a fan of Salmon, but is perfectly fine with spicy and loves peppers. Would this work well with chicken for her protein and salmon for her dad and I? Made this tonight with red Harissa, loved the combo with lemon and sugar. Awesome and easy to prep. Thanks! This recipe looks delicious. I am not a huge salmon fan, though. Would you recommend another fish that would work well? Thanks in advance! This is my kind of dinner! Totally delicious! I've been looking for a new way to make salmon. Thanks. what size fish is this? Isee the calorie counts ect but what is the portion size? 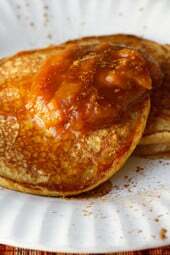 There is a web recipe I found that sounds as if it uses common ingredients. I've never had harissa before…. What type of side dish would go well with it? We loved it with broccoli but you could do orzo or couscous too. 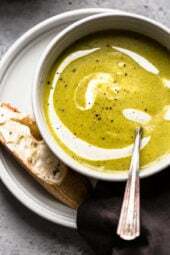 Daphne Oz has an easy recipe for harrisa in her book "Relish." I have a red harrisa recipe in The Skinnytaste Cookbook which you could use. Is there a recipe for the Asian-Marinated Salmon? It sounds like something my kids would enjoy as well! looks delicious! & what an "outside the box" pairing. Can't wait to try! Would red Harissa work just as well? where's the recipe for Harissa?? What exactly does harissa taste like? I luh-luh-LUHVE both Harissa and Salmon, and have them both in the fridge right now. But, for some reason, I have never put 'em together. I think you know what happens next. Love this! Pinned! It's a middle eastern condiment, I have a red harrissa recipe in my cookbook that I love!